"A Fully-Balanced DIN Tonearm harness for the Balanced-Input Flat/RIAA Phono Preamplifier." 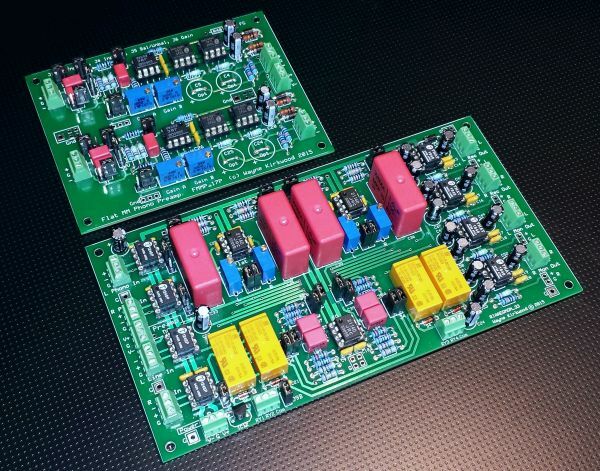 "A Jumper-Selectable RIAA/Inverse RIAA Network"
The Phono Transfer System is Offered Bare Circuit Boards, Boards plus ICs or Assembled and Tested as shown above. The RIAA EQ/Monitor Switcher Phono input may be routed to the Record Output either with or without RIAA de-emphasis. The Line Input may be routed to the Monitor Output either with or without RIAA de-emphasis and to the Record output with RIAA de-emphasis. Assembled PTS In Stock!